Western blot analysis of extracts from human adipocytes using Acetyl-CoA Carboxylase 2 (D5B9) Rabbit mAb. 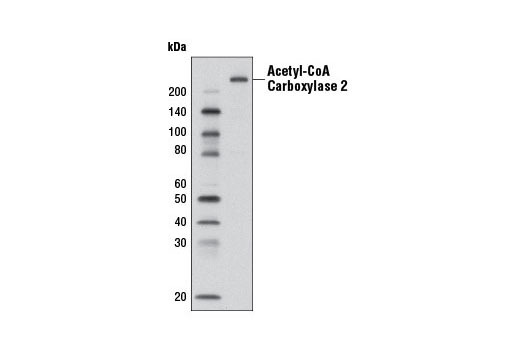 Acetyl-CoA Carboxylase 2 (D5B9) Rabbit mAb recognizes endogenous levels of total acetyl-CoA carboxylase 2 protein and does not cross-react acetyl-CoA carboxylase 1. Monoclonal antibody is produced by immunizing animals with a synthetic peptide corresponding to residues surrounding Val1400 of human acetyl-CoA carboxylase 2 protein.